Award-winning Chamber of Commerce has a long history and a bright future. Martin McNabb believes education is a catalyst for change. It’s the main reason he became a teacher, however his ‘education’ encompasses a wider world than the official world of formal schooling. “A friend of mine was complaining to me that his wife was refusing to wash his work clothes. ‘She says I should throw them out, they stink so much, but I can’t put on a new set of work clothes every day,’ he was saying to me,” says McNabb. McNabb pondered the dilemma his friend—and many other construction workers—was in. “As a person who knows a little about science, I thought there has to be a better way… and that was the beginning. I experimented with various substances and came up with a mixture of vegetable oils and some secret ingredients. After a good bit of trial and error, I eventually came up with a formula—and voila—it worked!” Thus was born GreenRelease, McNabb’s company. Six years have passed since that experiment and quietly and single-handedly McNabb has been going to professionals in the construction industry and telling them about his invention. Surprisingly, in the age of internet and hard-sell, most of McNabb’s customers have been swayed by word of mouth. “No one liked using the diesel oil,” he says frankly, “but at the time, there were no alternatives. Prolonged use of diesel makes the skin on your hands crack, and the strong smell permeates your body—not to mention your clothes. Born in Toronto 52 years ago, McNabb is the child of immigrants from Northern Ireland. “It was easier to get into a commonwealth country back then,” he explains, “but my parents held the United States as the ideal place to live, so when I was two years old, we moved to Los Angeles. After 13 years there, McNabb moved to Oregon where he stayed for the next 27 years, completing a Bachelor of Arts degree. He had a four year stint in Germany and a year in South America before coming to Vancouver and earning his teaching degree at UBC. One of the delights in operating GreenRelease for McNabb is that all his oil comes from restaurants that would dispose of their frying oil anyway. Oil can only be used for a limited time for frying before becoming a health hazard and has to be thrown out. Most of it used to go into pet food, but now there are quite a few businesses that are more than happy to take used oil. As more cars convert to bio-fuel, there is more demand for used oil. McNabb’s attention to his own ‘carbon footprint’ is obvious in his enthusiasm for GreenRelease’s growing number of clients. He also runs his own car on used vegetable oil, and sees that although bio-degradable oil isn’t a total solution, it’s part of the puzzle of finding better ways of doing things. 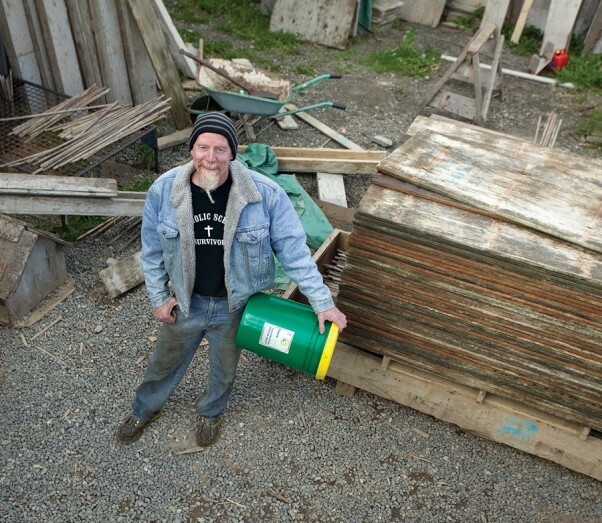 One of the first commercial outlets to use GreenRelease was Island Forms in the Comox Valley. “I talked to the owner and asked what he was using, and it was diesel oil, or engine oil, of course. Everyone used that because it’s cheaper than regular oil, as it’s used off-road and isn’t taxed. He was using 3,800 litres a year—all of which was going into the environment afterward. One of the other beauties about GreenRelease is that it’s totally bio-degradable—it turns into mold within a month,” McNabb says. “Island Forms tried it and really liked it, and it’s a small community where the concrete delivery people talk to their customers, and word spread. Another big outfit is Highland Concrete and they’re now using GreenRelease—it’s exciting. “Concrete is in everything,” McNabb says. “It’s ubiquitous—in our roads, our homes, all the pipes that carry waste, as well as clean water—and for centuries we’ve been using products that are harmful to the environment, as well as ourselves. But slowly and surely, things are coming around. I knew from my own experience how toxic diesel oil was—I’ve done my share of spraying it on forms—so I’m delighted that there’s something better for us all. For more information visit www.greenrelease.ca. was something of a hard-luck case during his own lifetime. Yet he left a legacy that is celebrated throughout much of the world today as the fastest growing water sport on the planet—dragon boat racing. Qu’s connection goes like this: He had been banished from his state of Chu by a corrupt king. Then he learned of the impending invasion of Chu by a neighbor state. This was too much for him so he tethered himself to a rock in a river to commit ritual suicide as a protest against the invasion. The good people of the kingdom rushed into the water in their fishing boats to try to save Qu, but it was to no avail. So, they beat drums and splashed water with their paddles to keep evil spirits from his body. Ultimately Qu Yuan’s legacy in China ended up being commemorated century after century on an annual basis by boat races that take place on the anniversary of his death. The boats are traditionally long and narrow canoe-style vessels decorated with carved heads and tails of dragons, which are held to be the rulers of the rivers and seas. The Comox Valley Dragonflies at practice. The Dragonflies are one of six teams in the Valley. Eventually the dragon boats spread beyond the confines of China and the races have now annual events in some 40 countries. And, as many Comox Valley residents—at least those that ever find themselves near local waters—know, dragon boating is very much a facet of the local scene. In British Columbia, dragon boating is part of the legacy of Vancouver’s Expo ‘86. At that event the Chinese delegation brought with them six teak dragon boats. From that grew the Canadian International Dragon Boat Festival, the first of its kind nationally, thanks to the efforts of David See Chai Lam and Milton Wong. This was the first dragon boat race/festival outside of Asia, created as a showcase of Vancouver’s growing cultural diversity and to promote racial harmony and cross cultural understanding. 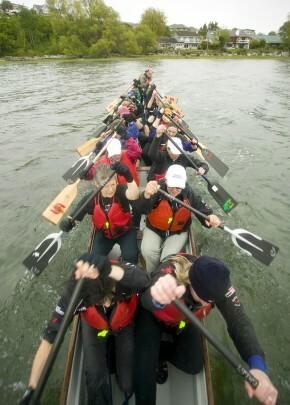 A decade later Dr. Don McKenzie of the University of BC, in conjunction with physiotherapist and breast cancer survivor Dr. Susan Harris, formed the first breast cancer survivor dragon boat team in Vancouver. Their intention was to prove that upper body exercise has a large role in recovery from breast cancer and lymphedema because it can improve the range of motion, reverse muscle atrophy, stimulate the immune system and activate skeletal muscles. The only criteria for becoming a member of a breast cancer survivor team is having had a history of breast cancer. Since that time dragon boating has grown immensely in popularity, with breast cancer survivor teams being a part of all festivals. In the Comox Valley the breast cancer survivor team, and the first dragon boat group on the local scene was Hope Afloat, which was formed in 2001 in conjunction with the Comox Recreation Commission. In the case of Hope Afloat a group of women in a support group were discussing full-time return to work after having completed their cancer treatments. It was at that meeting the topic of dragon boat racing came up. As it stood, the nearest option for getting involved in the sport was in Nanaimo. This was hardly practical for women who were working. As it turned out, four local women were involved with the mid-Island team. They were contacted and the wheels were set in motion. Within a few months, thanks to the support of Valley businesses, service clubs and individual donations, enough funds were raised to purchase the Valley’s first dragon boat. From that first purchase the concept of dragon boating took off in the Valley. Hope Afloat gifted their boat to the Comox Recreation Commission, which agreed to make it available to other groups who were interested in getting into the sport. The rest of the tale is, as they say, history. There remains, however, says Christine Saunders, Comox Valley Dragonflies team manager, a widespread assumption that dragon boating is still confined to breast cancer survivors (though they remain integral to the sport). Many teams, like the Dragonflies, are strictly recreational. The Dragonflies team (the oldest in the Valley after Hope Afloat) was formed in 2002. The Dragonflies compete in approximately four to five events through the racing season, and primarily compete as a mixed competitive team. However, they have also raced in a number of women’s festivals through the years. The Dragonflies are one of six teams in the Valley, including the original Hope Afloat team. Going back to the beginning for the Dragonflies, and for Saunders, it all came about due to an ad placed by Comox Rec in which they asked if anybody was interested in a dragon boat, as the Hope Afloat boat was now available for other user groups. Part of her personal motivation, Saunders says, was that she felt she needed to get involved in some sort of a sport, mainly because she needed the exercise and wanted to do something that appealed to her. Since she was raised by the sea, she felt that something to do with the water would work for her. Right from the beginning she found it to be a fine fit for her. It was a good group of people to be with and the sport demanded team solidarity in that all must pull together. People get tight with one another—figuratively and literally—in relatively short order. A further misconception about dragon boating (the first being that it is confined to breast cancer survivors) that Saunders would like to set straight is that it is not exclusively a female endeavor, but decidedly calls for gender mixed teams and they are, she says, always trying to attract men to the sport. Many men, Saunders adds, believe that dragon boating is strictly a female involvement, and at a certain level females must predominate. There are no exclusively male teams, but in any of the major competitions in which they have been involved, such as Victoria and Nanaimo, the biggest section is the mixed group. And, of the 20 people on a team, at least eight must be female. She notes that Fitness Excellence in the Valley offers dragon boat training and that it’s a good idea to take that sort of training, especially in the winter, before the season begins. “Winter is definitely a good time to get started,” she advises, as competition season isn’t the best time to learn, so it can be a bit disappointing for the newcomer since the others on the team are more advanced. Part of the allure, Saunders says, is the sense of solidarity that comes about from the experience. Everybody must be able to rely on everyone else in the boat. There is no hierarchy in that regard. While the Dragonflies initially used the boat made available from Comox Rec they have, since 2007, had their own boat—a boat with a special legacy and of which the team members are very proud. It came about when team member Monica Greenwood and her husband, Mel, donated the boat in memory of their son, Stephen, who had died in a car crash four years earlier. The boat is a BuK, which is built in Germany and is a crème-de-la-crème craft of the sort that has been used in many international competitions. But, the Dragonflies boat is even more than that, Saunders says. The boat has been enhanced by the talents of local artist Robert Lundquist, who endeavored—after listening to the Greenwoods’ story of their son—to bring his spirit to life as represented by the boat. Appropriately, the boat is called Stephen’s Spirit. Team solidarity is of course everything, and aside from having the boat that they cherish so greatly, the Dragonflies deck themselves out in T-shirts that follow the design of the boat. During the season they practice twice a week for an hour and a quarter, and in the winter, come rain or come shine, or sleet and virtually everything but heavy winds, they practice once a week. There is a definite process that must be learned and a participant’s skill can only improve with practice, she says. The paddlers in a dragon boat face forward (unlike aft-facing seated rowers) and use a specific type of paddle, which is not connected to the craft in any way. They paddle canoe-style with a very distinctive paddle type. The leading paddlers set the pace for the team and it’s essential that all paddlers be synchronized. Each paddler, Saunders says, should synchronize with the stroke or pacer on the opposite side of the boat. That is, if you paddle starboard side, you take your pace from the paddler on the port side. Meanwhile, the two pacers in the bow set the pace for the rest of the paddlers. Currently their team quotient is good, Saunders says. A number of new members have come out, which is good since five or six members left within the past year. And, as always, they are seeking more male participation. As far as age is concerned, there is no upper or lower limit, though participants should be physically mature due to the strength demands. “Right now I believe we range in age from about 30 to 70 years,” she says. This fastest growing of water sports on the globe is seconded only by outrigger paddling, which uses the same strokes, and the teams are often mutually supportive, says Saunders. What appeals to Saunders and many others in the sport is that it’s not encumbered by regulations limiting the involvement of its members. As an example, she will shortly be going to Victoria to race with another team and she observes that the teams change from one race to the next. At the same time, competition, such as the BC Seniors Games (Comox Valley and Campbell River, September 15-18) and festivals like Nautical Days in Comox bring out the apex of team spirit. For the Seniors Games, Saunders says, she’ll be on a mixed team, along with seven other members of the Dragonflies. She further notes that for competitions in other centres they do not, due to difficulty of transport, take their boat with them. Which, she admits, is too bad in one respect, but the logistics have to be respected. For more information on the Comox Valley Dragonflies visit www.cvdragonflies.ca. For breast cancer survivors who would like to be connected with Hope Afloat, go to www.hopeafloatcanada.ca. an ancient Chinese statesman (475-421 BC), treat was something of a hard-luck case during his own lifetime. Yet he left a legacy that is celebrated throughout much of the world today as the fastest growing water sport on the planet—dragon boat racing. You wouldn’t necessarily think that writing botanical reference books is an adventurous vocation—until you talk to Kahlee Keane. has just published Wild Medicine of Coastal British Columbia, click a practical guide to BC’s medicinal plants. She estimates that it is her 25th book—or thereabouts. In fact, she’s lost count. Keane has spent more than three decades researching and writing these books, as well as teaching workshops, leading educational walks, and writing newspaper and magazine articles. Along the way she has been renamed, honored, and royally told-off. She’s made great friends and stood up to worthy enemies. And she has consistently been awed at the healing powers of the plants that grow in the Earth’s wild places. Keane’s work has taken her into communities all over North America, where she has played a number of pivotal roles: anthropologist, historian, biologist, educator and activist. Wherever she goes, she galvanizes people to understand and appreciate the healing properties of native plants, to treasure them, and, if necessary, to campaign for their protection. Each of Keane’s books is dedicated to the plants of a certain geographical area, as broad as the province of Ontario or a specific as Grand Manan Island, a 135-square-kilometre fishing community of 2,500 people off the coast of New Brunswick. And each book has a different tone and structure, reflecting not just the local uniqueness of the botany but also the needs and inclinations of the locals. Although her books are all about plants, her research very much includes people. “Wherever I go, the first thing I do is look at the lay of the land and talk to the people who live on it. In Newfoundland, people had lots of information and what they needed was for me to collect and publish it. They were happy when I published their recipes. In Ontario, there was a real lack of information, so my job was to offer what I knew,” she explains. One thing Keane loves about her work is the connection it gives her to other cultures. Keane’s mission is to restore balance in the relationship between people and medicinal plants, both for the sake of the plants and for the sake of the humans. It also behoves them to make sure these plants continue to grow and thrive in their natural habitat. This is the other component of Keane’s mission. “As an eco-herbalist, activist and conservationist, my goal is to protect bio-diversity. My craft insists on a heightened ecological awareness and a deep respect for the living Earth,” she says. Not everyone understands that Keane’s work aligns with environmentalist aims, she adds. In fact, some people think she puts the plants at risk by encouraging humans to harvest them. “Oh, I’ve been confronted pretty aggressively,” she says with a wry chuckle. “I remember hearing a loud knock on my door one day, and I opened it to this big tall environmentalist who started in on me—‘How dare you publish this? You have to stop immediately!’ That kind of thing. The angry environmentalist did have a valid point, says Keane—medicinal wild plants are being lost due to over-picking. But Keane says this is a result of commercial harvesting, where big companies harvest in bulk to make products they sell all around the world. This is a far cry from what she teaches. In her books and workshops Keane encourages small-scale wildcrafting, where individuals go into the wild to harvest plants for the use of themselves, their friends, and their families. Wildcrafters respect the plant, and are often willing to work hard to protect it, she says. Seneca Root was being threatened both by over-picking and loss of habitat due to development. Keane worried it might be headed toward extinction. She’d seen this before—for instance, with Wild Ginseng in Ontario, which, she says, is now completely gone. Keane and her allies formed a non-profit group, Save our Species, which took as its first task the preservation of Seneca Root. They are still working on it; Keane remains hopeful, although cautiously so. While the fate of Seneca Root in the Canadian Prairies still hangs in the balance, the ongoing campaign to have it listed as endangered has brought people together in a powerful way, says Keane. “My years in Saskatchewan were very exciting; there was so much camaraderie, so much willingness to cooperate and pitch in to do the work to save this plant,” she says, sitting back in her chair with a smile of satisfaction. Another source of satisfaction, for Keane, is seeing people wake up to the realization that they can use plants to heal themselves. Humans have used plants for healing for millennia, all over the world, she points out. Our modern pharmaceutical system is, in a way, an outgrowth of this. Nearly 50 per cent of the thousands of medications prescribed today are either derived from plant sources or contain a chemical, synthetic imitation of a plant compound. “Since we did not evolve with these synthetics, our bodies do not always have pathways for their distribution and elimination,” she explains. Although synthetic drugs have certainly performed miracles and saved lives, virtually all of these drugs have side effects ranging from the unpleasant to the lethal. Using wild medicinal plants not only offers an alternative to the use of pharmaceuticals, it also provides a very different experience of healing. Instead of visiting a doctor’s office or a hospital, people go out into the forests and mountains; they can make the medicine themselves and they know exactly where it comes from. “When people see that this works, they are thrilled!” Keane says. Keane doesn’t consider herself a healer; she would rather see people learn to heal themselves. This is why she became a writer. Originally, Keane was an accountant, a profession she found “terribly dry,” she says with a merry laugh. 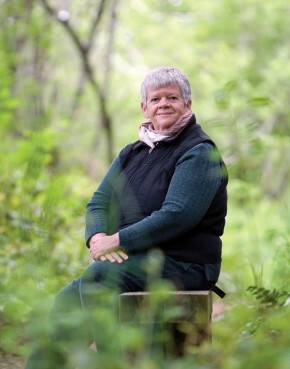 Thirty-five years ago she left accounting to study herbal medicine. When Keane feels her research is complete and she is ready to write a book, she throws herself into an intensive period of writing, writing, writing till it’s done. Keane says BC has a plethora of wonderful healing plants. However, she is able to choose a favorite. Recent research has confirmed the use of Devil’s Club, a member of the famous ginseng family, for respiratory problems, including Tuberculosis. This is of particular interest to the medical world, since some strains of Tuberculosis have been developing a resistance to commonly used pharmaceutical drugs. There is more information about Devil’s Club, and 42 other medicinal plants, in Wild Medicine of Coastal British Columbia. For more information and to order books visit www.gaian.ca. has just published Wild Medicine of Coastal British Columbia, a practical guide to BC’s medicinal plants. She estimates that it is her 25th book—or thereabouts. In fact, she’s lost count. you could easily drive by the Snap Dragon Goat Dairy and be unaware that it was there. Karen Fouracre and Jaki Ayton have been developing their compact 1.6 acre farm for the last 14 years. A mixed farming operation, they raise hogs for meat, goats for milk, and chickens for eggs. There are gardens and a 40-foot greenhouse in the front yard. Peach, pear, cherry, apple and plum trees are sprinkled around the property. Behind the house you’ll find various small buildings, the new milking parlor, several paddocks and pastures. Over the years they have tried raising ducks, turkeys, sheep, rabbits, peacocks and cows to see what works best for them and their property. Goats have been part of the herd from the start. In addition to providing milk, the goats have contributed to Ayton and Fouracre’s recreation opportunities and extended their network of friends. 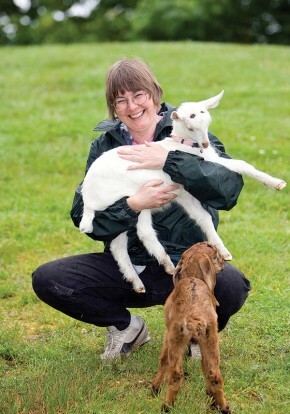 The idea to establish a micro dairy came when David Wood, the owner of the Salt Spring Island Cheese Company, approached the Vancouver Island Goat Association (VIGA) last fall looking for milk from Island producers. He was buying milk in the Fraser Valley and wanted to find sources closer to home. As members of the VIGA, Fouracre and Ayton heard of the enquiry and they immediately began to investigate whether or not they could start a dairy. Selling their milk to the cheese company would provide them with a way to offset the costs of keeping their ever-growing goat herd. In order to get licensed as a Grade A dairy, Fouracre and Ayton had to absorb the very detailed regulations of the BC Dairy code and build to its strict specifications. “It was a matter of finding people who could help us out,” explains Ayton of how they approached the task. “Island Dairy Products is the guy who services all the big dairies. So we phoned Lawrence, we talked to him. He’s been a really good resource. We talked to Gerald Smith who has a sheep dairy and asked him tons of questions. I talked to some of the big goat dairy people on the mainland, and just asking questions, reading it, checking, emailing the BC licensing place back and forth, etc.” In the Fanny Bay community they found many people to help them, including retired dairyman and neighbor Glenn Plewis, who assisted with contacts to source the various components needed. It took three months to find a dairy tank that would work. They finally found one in the Fraser Valley—at 1,000 litres it is bigger than they need but the smallest they could find. Karen had to significantly modify the plans for the milking parlor/processing building in order to make it fit. In order to meet the goal of shipping milk in May, many of their friends and Holiday Road neighbors have been called upon to assist with their expertise and a helping hand. They are most appreciative of all the assistance they have received and they look forward to paying it back with their own labor. “We’ve had friends, three or four times now, we’ve had anywhere from two to seven of them show up for a day and help us build,” says Fouracre. On May 10 their dairy dream became a reality when Salt Spring Island Cheese owner David Wood came to help pick up the first shipment of milk. Wood, originally from Scotland, moved to Toronto in 1973 to work as executive director of Pollution Probe. His entrepreneurial endeavors prior to establishing Salt Spring Island Cheese in 1994 included Solartech, a renewable energy company, and, the David Wood Food Shop, which by 1989 included three Toronto stores and a catering division. 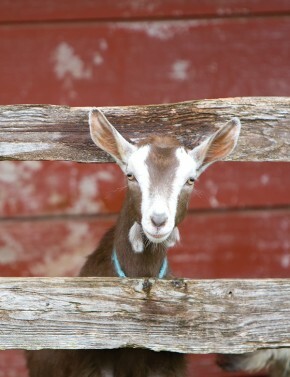 Salt Spring Island Cheese specializes in handmade goat and sheep cheeses. Mastering the art of animal husbandry is their number one recommendation for anyone thinking of setting up a dairy. Get to know your animals and how to care for them. This will keep them healthy, which will ensure a good product and will keep the vet bills down. They are very proud of the fact that their goats have nice personalities and, on average, they live to be about 24 years of age. The average life span for a goat is about 15 years. Another tip from Fouracre: “Keep the farm clean and tidy because if you don’t, you’ll have a vet bill. If there is something lying around that shouldn’t be there, you should move it. Either that or it is going to be tripped over, stepped on or swallowed. But they are now dedicated farmers by choice. Ayton still works off the farm in public health but with the launch of the dairy, Fouracre is now working at home full time. In addition to her dairy chores, she will also be selling produce, flowers, eggs, fruit and hand-drawn art cards from a farm stall. They love what they do and where they live. They also love sharing the experience with others. This past April they held their second “Open Farm Day” where anyone interested was invited to visit the farm and see the animals up close. Donations are collected to go to YANA and it also serves as a form of self-preservation. Watch for their ads next year so you don’t miss the chance to visit these two interesting women and see this most unique micro dairy operation. The past is very much present in Cumberland—and a tangible expression of this intersection of the historic and the contemporary is the annual Miners’ Memorial Weekend. 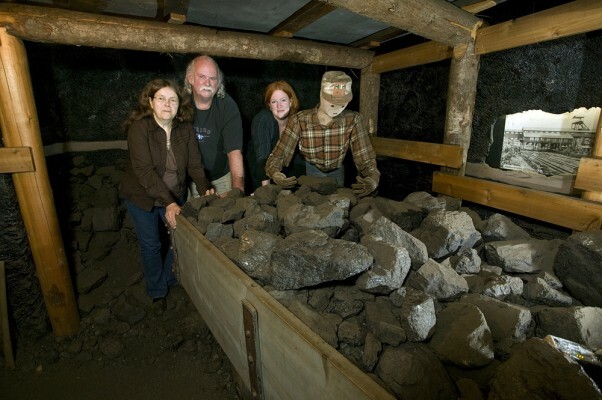 Presented by the Cumberland and District Historical Society, this year’s 25th anniversary event on the weekend of June 18-19 commemorates the miners who worked, lived, and died in the mines at Cumberland as well as throughout the world. By means of music, story, and ceremony, the event is a celebration of workers and their families. In the quiet dimness of the Cumberland Museum, plans for the event are at full steam. Museum board members Meaghan Cursons and Brian Charlton sift through boxes of archival material for a possible exhibit. Joined by Anne Davis, president of the Courtenay, Campbell River and District Labor Council, the group looks through the old newspaper clippings, posters, and photographs of past events. “This is the Miners’ Memorial Day Box!” says Cursons, pulling from it an old program with a photo of the Memorial Cairn from #6 Mine. “1986—that would have been the first event,” says Charlton, reading the date. “Here are some of the press releases. Who’s in that picture?” Cursons wonders. “Rosemary Brown, Wayne Bradley, is that Roger Crowther?” begins Davis, and Charlton completes her thought: “They all look so young!” Everyone laughs. The next morning the BCGEU hosts a pancake breakfast from 8-11am. “Again this is open to community, here at the OAP,” says Cursons. “All the proceeds go to the museum.” At 11am there will be a guided tour of the Cumberland Museum. The Campbell River, Courtenay and District Labor Council, the Cumberland OAP and the Cumberland Chamber of Commerce are all supporting the event to benefit the museum’s programming, operations, and labor and mining history exhibits. Ginger Goodwin’s funeral procession, August 1918. Photo courtesy Cumberland Archives & Musuem C110-001. “At noon on Saturday, there’s a group who are going to walk to the cemetery—recreate the funeral walk from Ginger Goodwin’s funeral,” Cursons continues. Ginger Goodwin was the well-known coalminer and labor organizer whose leadership of several strikes and outspoken opposition to the 1914-18 war brought him to the attention of authorities. Despite his health problems, his conscription status was changed from ‘unfit’ to ‘fit for service in an overseas fighting unit’. He went into hiding in the bush near Cumberland, with the help of townspeople, but was tracked down and shot by a hired private policeman on July 27, 1918. His death sparked Canada’s first General Strike. “There was a processional of people from Cumberland all the way to the graveyard—and there wasn’t a single dry eye,” says Cursons, quoting the reports of the time. Anne Davis has researched the route described in Ruth Masters’ book of local history at the museum, and the group will try to recreate the same route for the procession on June 19. Davis has a personal story of Ginger Goodwin’s influence. “When I moved here in 1974, I was 19, and my then partner and I bought one of the old houses on Camp Road. It had belonged to Jimmy Ellis, who had gone into care at that point,” she says. “I went down one afternoon to meet him at the old folks home to just ask him some questions about the house and he sat me down and told me the story of Ginger Goodwin. Speakers at the cemetery will include labor leaders and historians. “It’s an open mic, which can be interesting!” says Charlton, “because you get some fiery rhetoric—young Turks—like a lot of the Wobblies (the IWW – Industrial Workers of the World) and some of the other political groups. Davis agrees. “I think that’s partly what draws people to come from Vancouver and Victoria too,” she says. The ceremony consists of a “combination of music and speeches, and laying of the wreaths—bouquets this year,” says Cursons, noting that the memorial flowers are traditionally ordered and placed by unions, but any family, business or individual can order a commemorative tribute. Cursons recommends ordering the tribute bouquets before June 10 through the Cumberland Museum. “It’s also a fundraiser for the museum,” she says. “But something we’ve discussed this year—talking about workers and workers’ rights—is that the international cut flower industry is devastating for women. There is heavy pesticide use throughout the cut flower industry. So this year we had a real serious conversation about where those flowers are coming from—we’re doing fair trade flowers for the bouquets from Comox Valley Flower Mart. At 3:30 pm on Saturday local historian Gwyn Sproule will lead a walking tour leaving from the museum, of the Cumberland mine sites. Registration for the tour is not required; however advance tickets for $15 are necessary for the Miners’ Memorial Day Dinner at 6 pm. “The big dinner is put on by the Cumberland Museum Board,” says Cursons. “At that event Stephen Hume will be speaking, and Jim Sinclair. There will be music and TheatreWorks is going to be doing a performance.” Depending on numbers, the dinner will either be at the OAP or the CRI. All food for the dinner is donated from local businesses, with proceeds going to the museum. “I think Miners’ Memorial Day is where people’s politics and their cultural expression line up— it’s not a dry political event. It has a very political cultural component. I like politics in our art and our craft!” Cursons says, acknowledging she also wrote a song that came out of Miners’ Memorial Day. That thought further inspires the planning group. “I think we’ve got enough songs now for a CD!” says Charlton with a laugh. “As a fundraiser for the museum,” adds Davis. “Brian’s got a line on pretty well every Ginger Goodwin song that’s been written!” The idea catches on, with suggestions of songs to include: Cumberland Waltz by Wyckham Porteous, The Day They Shot Ginger Down by Gordon Carter, and songs by Joey Keithley, David Robics and Richard von Fuchs. Clearly Miners’ Memorial Weekend isn’t just a memorial caught in the past. Cultural elements of the event are constantly being renewed, in a continual connection to contemporary issues. The 25-year history of the memorial event itself is now part of the story of Cumberland as a community. For more about the event visit: www.cumberlandmuseum.ca. this year’s 25th anniversary event on the weekend of June 18-19 commemorates the miners who worked, lived, and died in the mines at Cumberland as well as throughout the world. By means of music, story, and ceremony, the event is a celebration of workers and their families. we may identify the names Kilpatrick, remedy Simms, Willemar, Rickson, Idiens, McPhee, Guthrie and Wood—to name a few—as the names of local roads and landmarks, but they are, in fact, the names of insightful pioneers of industry and commerce for the Comox Valley. 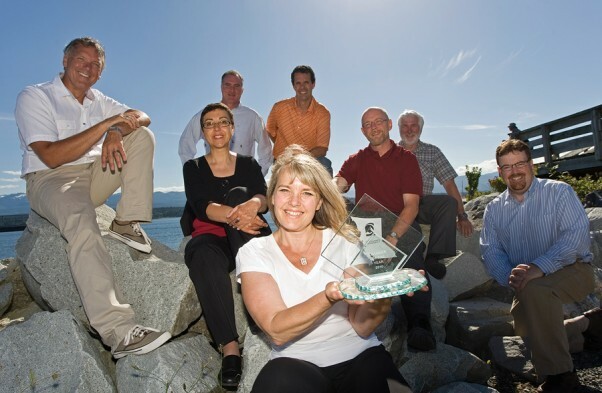 Comox Valley Chamber of Commerce Executive Director Dianne Hawkins shows off their Chamber of the Year award, achieved with the help of the Chamber board and community partners, from left: Kip Keylock, Shirley de Silva, Bill Anglin, Jeff Lucas, Greg Phelps, Bruce Brautigan and Paul Ives. Over the course of more than 90 years, the Board of Trade—now known as the CVCC—has been required to adapt to changing times. It has supported economic development and community collaboration through the Great Depression, the market crashes of the 1980s and today’s global economic crisis. Despite recent trade and industry challenges—or perhaps because of them—membership in the CVCC has increased dramatically in the past five years and is currently at a record high. If there was ever a time to “rally the troops” this is it! Alongside the long list of new CVCC members are many who have supported the Chamber for decades. 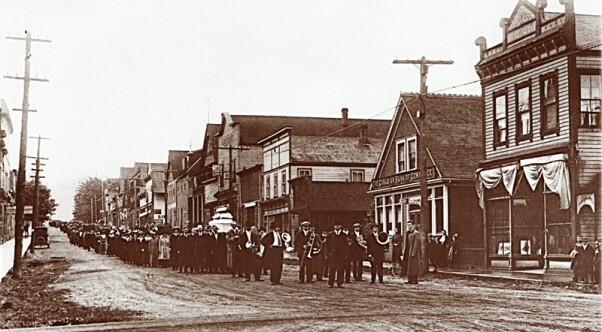 CIBC, for example, joined the Courtenay Board of Trade in 1919; Central Builders lays claim to a 50-year membership, with the exception of a short lapse in membership during a change in ownership; and Mike Finneron Pontiac-Buick (Now Hyundi) has been a member for more than 25 years. The ways in which the CVCC promotes our region are both varied and impressive. Its main goal is to create and sustain programs designed to help member businesses build relationships and create strategic alliances that will promote economic growth. That said, while promoting ‘business,’ Chamber members never forget the importance of ‘community.’ It champions grassroots programs such as environmental awareness initiatives and, along with various other community partners, was one of the sponsors of the recent 30-Day Local Food Challenge. A great example of an environmental awareness initiative is the CVCC’s Bagless Comox Valley program, launched in 2009. This was a major undertaking that was embraced by both businesses and individuals in the community. After lengthy discussions and collaboration with retailers, CVCC secured a bulk order for 85,000 reusable shopping bags that retailers could purchase and then sell or use as giveaways. The bags, which featured the Comox Glacier on both sides, came with the option of being printed with each individual retailer’s name and logo. An initiative of Our Big Earth, the Second Annual 30-Day Local Food Challenge, for example, encouraged Valley residents to ‘Dig in and Eat Local!’ (www.eatlocalcomoxvalley.com). The Food Challenge is a series of hands-on workshops, tours and fun community events celebrating the agricultural sector in the Comox Valley. More than 30 vendors representing food producers and restaurants banded together to present this event and encourage people to taste, explore, connect and learn about farmers, food producers and the people who create our food. The CVCC, which operates the Visitor Centre out of their building in Courtenay, also forges partnerships with various community stakeholders to promote tourism and commerce in the Valley. A recent project that gained considerable media attention was sponsoring the Ghana Ski Team’s 2010 Olympic training. Hawkins worked with Sarah Nicholson, manager of Tourism Mount Washington, to find 10 Chamber members to sponsors the ‘Snow Leopard.’ This backing included extensive media coverage, team accommodation, a team vehicle for transport, and even a Tourism Vancouver Island sponsored eco-tour in the Seymour Narrows with the team and the Australian television media. “The team was well aware that without the vision and determination of Tourism Mount Washington and the Comox Valley Chamber of Commerce, the Ghana ski team would not have had a pre-game training facility in Canada,” says Richard Harpham, team manager. Not only did the Snow Leopard program help the Ghana ski team, it helped bring some of the thrill of the 2010 Vancouver Winter Olympics to the Comox Valley. Kids lined up to get Snow Leopard autographs and waved with excitement when the gaily-decorated Snow Leopard van drove by. The Chamber is also the voice of business in the Comox Valley and effectively advocates to all levels of government on issues relevant to the local business community. In 2009, for example, CVCC made formal presentations to both the Town of Comox and the City of Courtenay, asking that a reduction in the property tax multiplier for business properties be considered. They were successful in getting the multiplier reduced in Courtenay and were invited back to both councils for 2010, to ensure the issue is given due consideration for future budget discussions. Another major initiative of the CVCC was providing input to the Regional Growth Strategy. Working in partnership with the Cumberland Chamber of Commerce, The Comox Valley Regional District, Comox Valley Land Trust and local business leaders, CVCC drafted two working papers with specific recommendations; these are posted on their website. The Regional Growth Strategy covers a wide range of issues, from population and demographics to affordable housing, farmland, food security, economic development, transportation, infrastructure and much more. Another important aspect of the Chamber is creating an environment for members to encourage connections. Efforts in this area are believed to be one of the major reasons for the Chamber’s growth in the last five years. “Networking is a word that is overused—it is really about developing relationships and it is not easy to make business connections on your own,” says CVCC past president, Linda Oprica of Ascent Coaching. The efforts of the CVCC have not gone unnoticed. Impressed by the work the Chamber is undertaking in our community, Courtenay Mayor Greg Phelps submitted a nomination for it to be considered for the BC Chamber of the Year Award. This nomination required the CVCC to submit extensive supporting documentation outlining some of the group’s key initiatives, as mentioned above. In early 2010, they learned that they, along with the Greater Victoria and Langley Chambers, were finalists for this prestigious designation. On May 29th, at a gala reception at the BC Chamber Annual General Meeting and Conference in Vancouver, the Comox Valley Chamber was presented with the award. The CVCC may soon have another opportunity to shine. Dianne Hawkins has been nominated for the Canadian Chamber of Commerce Executive of the Year Award. To the best of their knowledge, it is the first time anyone from Vancouver Island has been nominated for this honor. The winner will be announced in September at a ceremony in Gatineau, Quebec. Hawkins bubbles with enthusiasm when asked about Chamber activities, but appears humbled when one mentions the most recent nomination and her individual contribution to the recent achievements of the CVCC. Don Sharpe, another CVCC past president and director of business operations at Mount Washington, explains that Hawkins was hired six years ago in an effort to create better credibility for the board. “Dianne’s leadership and enthusiasm, under the direction of the Board of Directors, supported by a great staff and amazing volunteers, has resulted in the CVCC having a voice that is not only heard, but one that is listened to,” says Sharpe. Oprica agrees. “The BC Chamber of the Year award is justifiable recognition of the last six years of very dedicated and focused effort,” she says. “There has been a real shift in energy since Dianne was hired as the executive director. It is important to have one key person to maintain the vision and carry it forward, but it is a cumulative effort. We all rolled up our collective sleeves and got to work. It was time for change and Dianne was the right person to lead the charge.” Sharpe adds that one of the key reasons for the success of the organization, especially in the past decade, is that considerable effort is now put into succession planning. Key positions on the board change annually, which encourages new people to bring fresh ideas and energy to the various roles. Substantial effort is also put into ensuring that each new board is diverse, representing a variety of industries and commerce. “It is important to have varied opinions and areas of expertise,” Sharpe says. For current President Jeff Lucas, the Chamber is well-situated as the voice of business in the Valley. “I think that we are in a very fortunate position right now,” he says. “Our membership has never been stronger and there is open communication and strong dialogue between us and every governing body in the Comox Valley. Still humble, Hawkins explains that she lives her life and does her job at the Chamber guided, in part, by the wise words of one of North America’s most highly quoted individuals, Ralph Waldo Emerson. The Chamber office is located at 2040 Cliffe Avenue, Courtenay. For more information about the Comox Valley Chamber, upcoming events, benefits of membership or to become a member phone 250-334-3234 or visit their webste at www.comoxvalleychamber.com.